One loving family's motto is definitely "the more the merrier" when it comes to dogs - and now they've extended that to chickens, too. A family who runs an Instagram account about their life with multiple rescue dogs has just gotten even cuter because the rescue dogs now have new playmates. 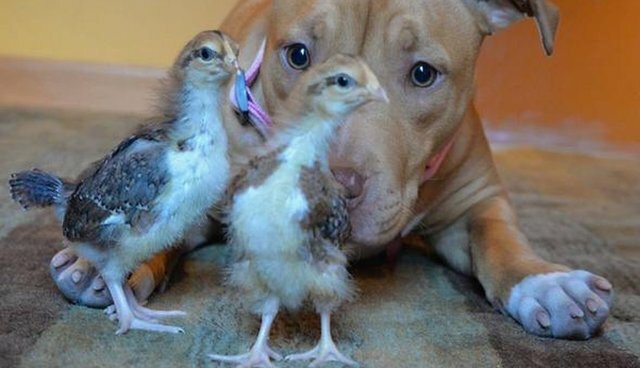 Some of the other dogs in the family are unsure about the little chicks, but Penny, a pit bull puppy, is pretty mesmerized. Penny treats the chicks like her brand new best friends, and is super gentle and sweet when playing with them - and the chicks seem to love Penny right back! One of the other dogs in the family, Kilo, has also taken a liking to the chickens, but still not nearly as much as Penny. Maybe since Penny is the puppy she feels like she finally gets to play big sister to someone instead of always being the baby. Whatever the reason, we can only hope that Penny's friendship with the chickens continues to grow ... so we can continue to see pictures as they get older together. Check out more pictures of baby Penny growing up with her dog siblings here! If you're ready to add a pet in need to your own family, check out Adopt-a-Pet.com to get started.